KARACHI: Pakistan’s rising batting star Fakhar Zaman has emphatically declared that Saeed Anwar’s epic knock against India was a far better achievement than his own record-breaking double century during last month’s ODI series in Zimbabwe. The affable Fakhar stole the limelight at the PCB’s Annual Cricket Awards ceremony, which was held in collaboration with Titans Autographs and Memorabilia, by paying glowing tribute to Saeed who scored a memorable 194 — a world record that stood for six years — from only 146 balls at Chennai in May 1997 during the Independence Cup clash which Pakistan won by 35 runs. “There is no doubt in my mind that nobody can ever come close to matching that stupendous innings from Saeed bhai. It was a phenomenal achievement considering it came against India in sweltering conditions,” Fakhar said after receiving Rs2.5 million special award for the most outstanding performance during the ceremony held at a five-star hotel on Wednesday night. Saeed Anwar, a left-hander like Fakhar, scored 8,824 runs (averaging 45.52) and hit 20 centuries in 247 ODIs in a glittering 14-year career before retiring after the 2003 World Cup in South Africa. He also made 4,052 runs in 55 Tests with 11 hundreds after bagging a pair on debut against the West Indies at Faisalabad in November 1990. Fakhar is the quickest to the 1,000-run landmark in all ODIs, getting to the milestone in only 18 matches. Pakistan captain Sarfraz Ahmed, who didn’t miss a single international fixture during the past year, bagged the coveted Imtiaz Ahmed ‘Spirit of Cricket’ award. 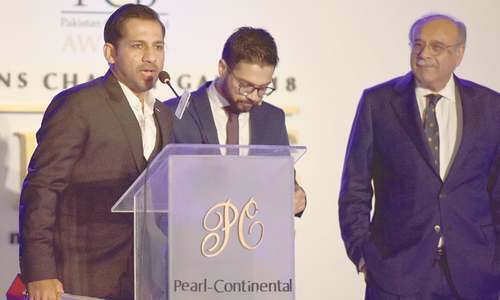 In a brief speech after receiving Rs1 million cash prize, Sarfraz held high hopes for Pakistan in a very busy season in the lead-up to next year’s ICC World Cup in England while lauding the contributions of his charges in ensuring Pakistan retain the top ranking in T20 Internationals. Seamer Mohammad Abbas, who is currently away in England playing for Leicestershire in the County Championship, won the Test Player-of-the-Year prize for picking up 27 wickets in five matches, while Hasan Ali’s 33 victims fetched him the ODI Player-of-the-Year prize. Babar Azam clinched the T20 Player-of-the-Year award for his tally of 489 runs in the shortest format. Pace-bowling all-rounder Faheem Ashraf won the Emerging Player prize. In the women’s category, Gilgit-born Diana Baig earned the emerging player award with her Pakistan team-mates Sana Mir and Javeria Wadood Khan taking the ODI and T20 prizes, respectively. While most of the awards were given on performance-based criteria, glaringly there were several dubious recipients on the night, while exposing the Pakistan Cricket Board’s credibility. At least two of the award winners were far from merit. Asif Yaqoob, who only made his debut at the first-class level just a couple of seasons ago and already assigned to supervise more matches of the PSL 3 than Khalid Mahmood — widely rated among the best umpires in the country and one who has been officiating in top domestic competitions for 24 seasons now — was given the ‘Best Umpire’ award at the behest of Shakil Sheikh, the influential president of the Islamabad Cricket Association and a close aide of PCB chairman Najam Sethi. The other choice was Azhar Hussain, who was awarded the best Scorer-of-the-Year despite being an average scorer while the credentials of several outstanding scorers, such as Arif Majeed Arif and Syed Imran Ali, were overlooked. Other award winners were Mohammad Anees (best referee), Riaz Ahmed (best curator), Shan Masood (best batsman, domestic), Aizaz Cheema (best bowler, domestic), Kamran Akmal (best wicket-keeper, domestic), (Javeria Wadood Khan (best woman batter, domestic), Diana Baig (best woman bowler, domestic) and Sidra Nawaz (best woman wicket-keeper, domestic). Special awards were also presented to Pakistan’s physical disability team skipper Nihar Alam, deaf and dumb cricketer Mohammad Naveed Qamar and blind player Amir Ishfaq. Meanwhile, auction of several cricketing memorabilia was conducted on the sidelines of the awards’ ceremony which drew scant response from the overcrowded audience, judging by the prices the items on offer were bought for. The proceedings of the auctioned memorabilia were donated to Shahid Afridi Foundation, the Edhi Foundation and Project-91.